GentelDark Series: Part 2 is several dark variants of the MyGentelella style which is a theme for the MyBB AdminCp. The theme is responsive and it is maded with bootstrap. 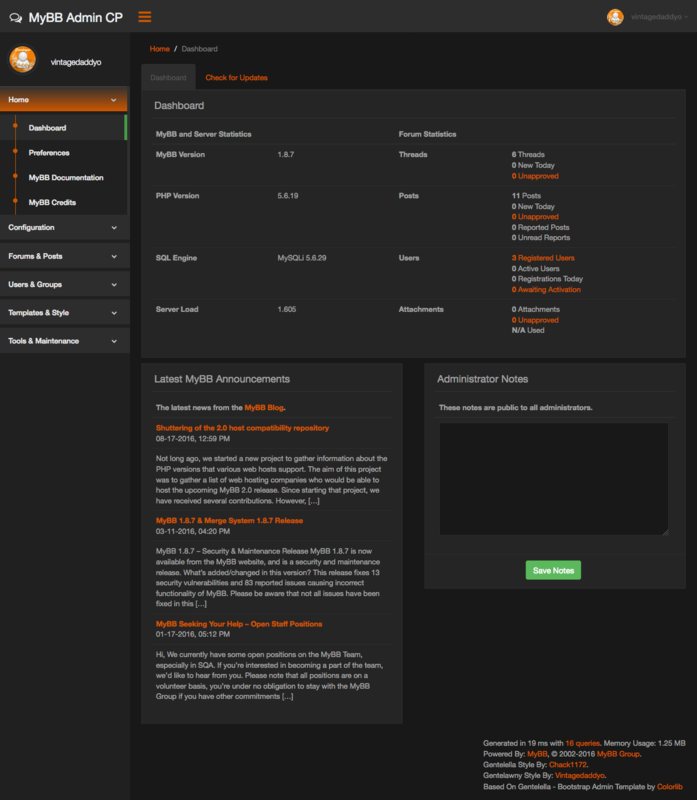 The theme is based on the Gentelella admin control panel of Colorlib. 4.) Select "Gentelawny" & then press: "Save Personal Notes & Preferences"
You may not remove or change the MyBB copyright nor the Style by: "Vintagedaddyo & Chack1172" statements in the footer of this ACP Style's templates. You may use and modify this ACP Style to your personal likings, but redistributing any modified version that removes the previously mentioned credits for download is prohibited, unless you have explicit written permission from "Vintagedaddyo & Chack1172", though you are allowed to redistribute a copy that has not had the credits modified. 4.) Select "Gentelim" & then press: "Save Personal Notes & Preferences"